This entry was posted in Parrot Health & Safety. Bookmark the permalink. Thank you for researching this and publishing! We really appreciate it. That’s awesome you researched this. Thanks Michelle! Thanks for getting a definitive and thorough answer for us! Thank you for this information. Do you know anything about the cooking bags, such as Reynolds brand? I use them at thanksgiving for the turkey. Also those mats that firt in the bottom of the oven to catch spills? I have not researched this myself but I have been told to never ever use them. My Avian vet states she knows of several families that have lost beloved birds after using them as they release some chemical into the air when heated. Also no microwave popcorn or non stick foil! again, I do not know this first hand but have never used these products out of fear of the end result. I have no first hand experience but was told my Avian vet to never ever use them. She knows of several cases of families losing their beloved birds due to the cooking bags as well as microwave popcorn and non stick foil. Again, I have no experience first hand bc I don’t use them out of fear for my babies. I was told they all release deadly fumes when heated. 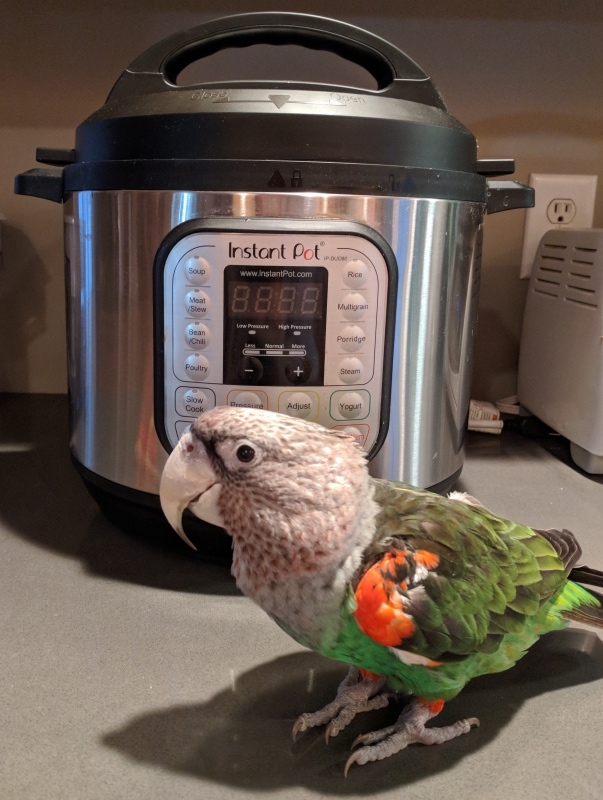 One woman posted the pictures on a Facebook site dedicated to parrots, of several of her pet birds (which I think she could have spared us all- it didn’t seem appropriate), after she had used those type cooking bags. I was just goggling this very question. Thank you for getting an answer and making it available to other bird lovers! Thank you for the information. I will spread the word!! Insta pots are safe. Do you happen to know if this holds true for the non-stick liners? I don’t use one, but am curious. That’s great! But I’m a little concerned about the lead and cadmium coating the heating element. It may be compliant with that standard, but that doesn’t mean it’s not harmful to birds, especially heated. I would like more information about that before considering it safe to use around birds. I was wondering if anyone has research the cadmium levels and lead levels parrots are safe around. Remember the levels I think are for humans that were posted. I just found out about the seal ROHS Compliant that can be found on led bulbs and other electrical things. Not sure if kitchen appliances can have this seal. Another thing to research. After owning parrots for 29 yrs its frustrating to still be weary about almost everything.